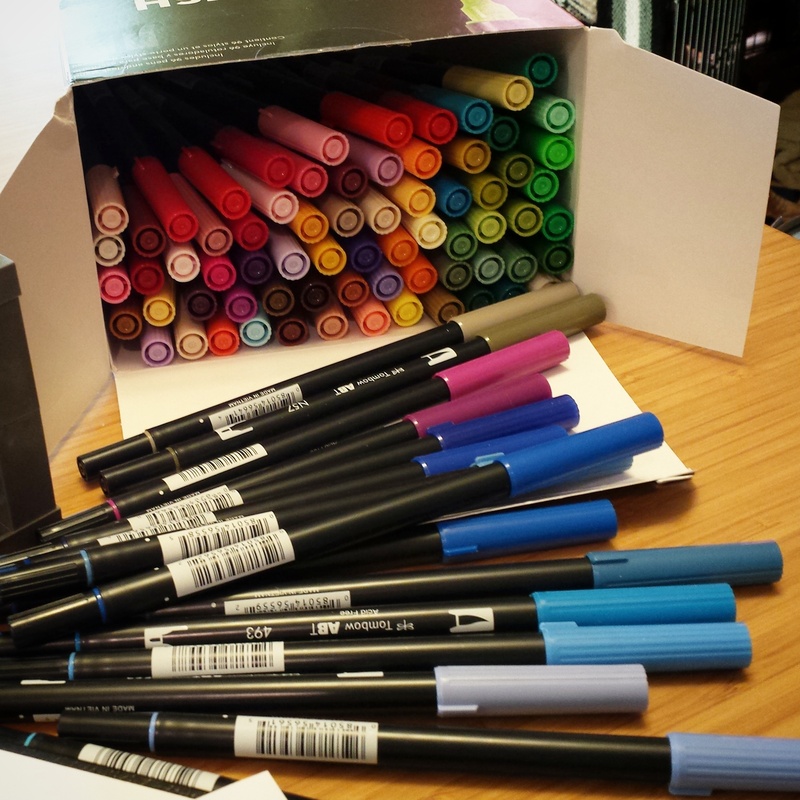 Tombow Dual Brush Markers, oh the pretty colors! 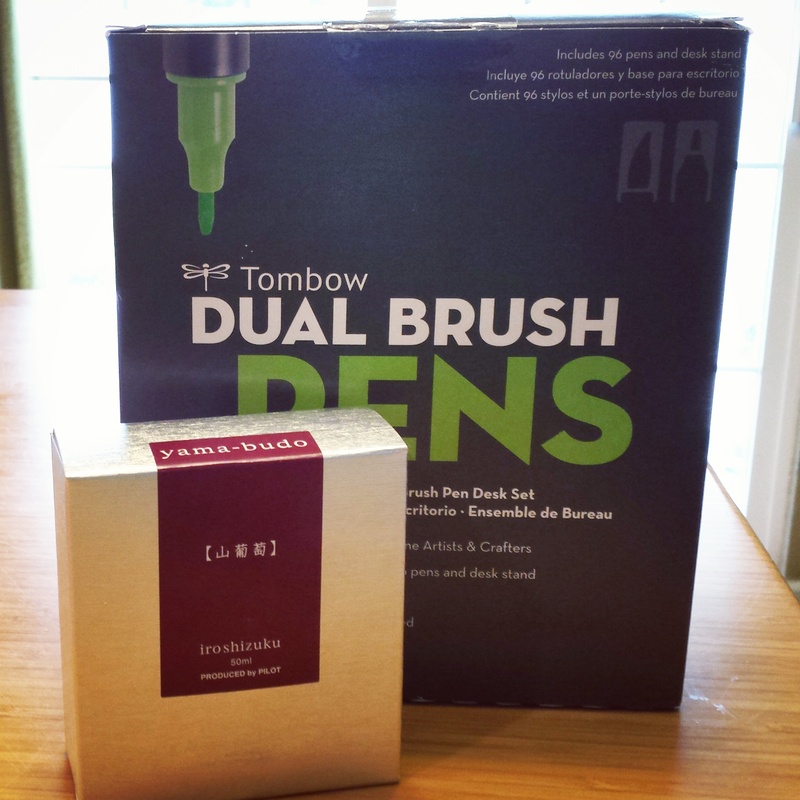 For my birthday last month I was lucky enough to receive the full set of 96 Tombow Dual Brush markers (with stand! ), and they. Are. AMAZING. 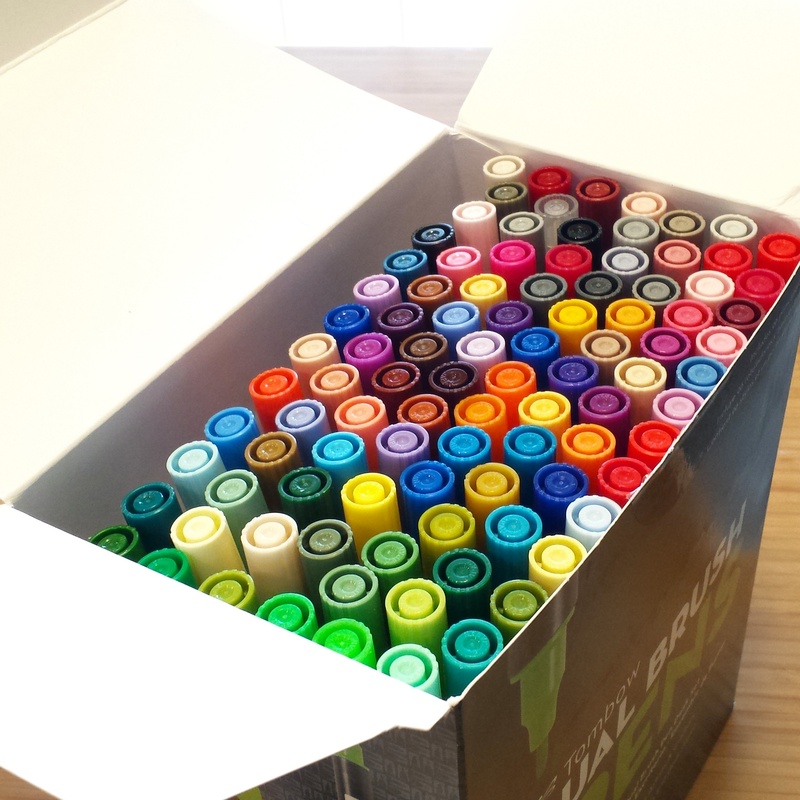 Just look at all the pretty colors!!! So of course, first thing I did was try and organize them into an approximate ROYGBV order, because the color, it must be organized. It’s not perfect, but there will be several attempts in the future haha. 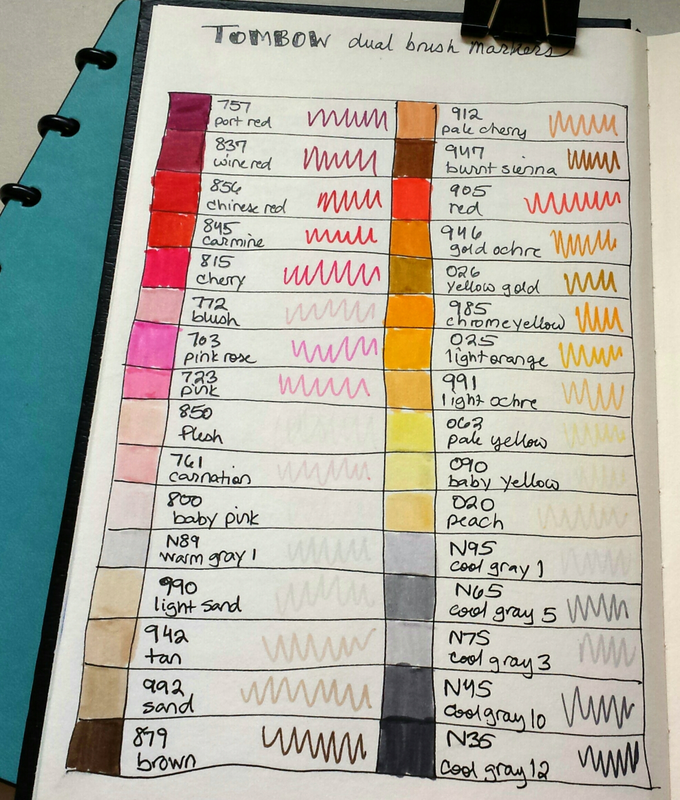 I also had to do a rudimentary color chart of course! 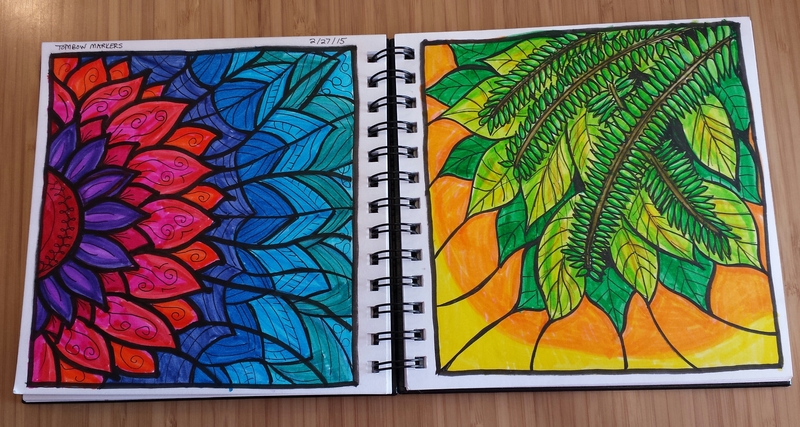 Just quick scribbles in my Stillman and Birn Zeta 7×7 series sketchbook. 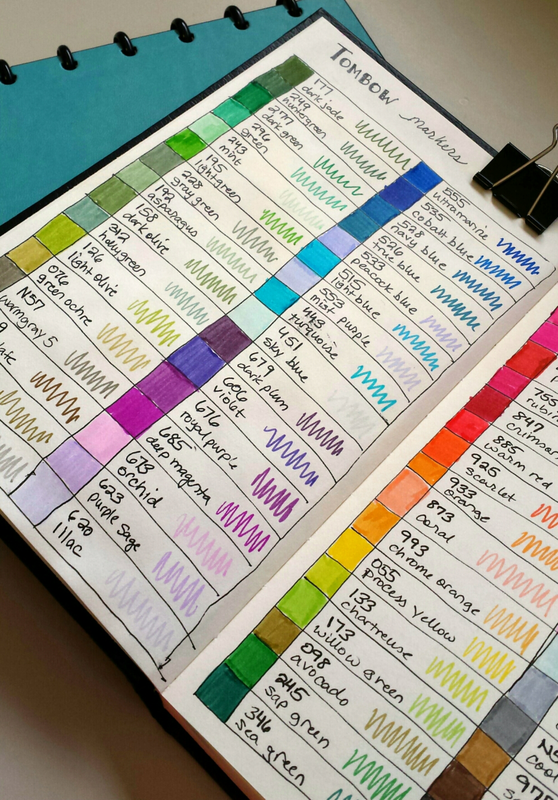 Because I have color charts in most every sketchbook, I thought I’d see how my new Tombow markers worked on my Stillman and Birn Gamma Series paper. Results? It took the marker pretty well, although the streak lines from the marker are more evident on this thinner, rougher paper. 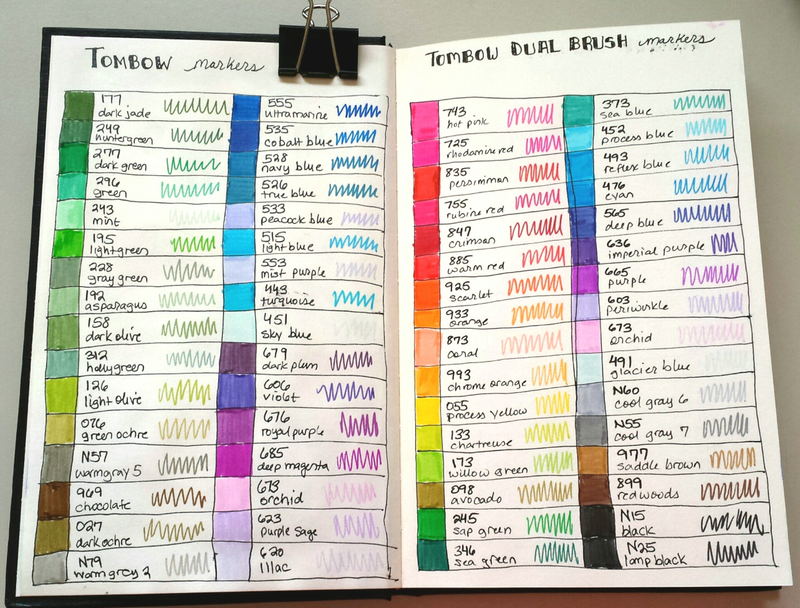 I’ve been drawn to the Tombow marker medium over and over again in my Stillman & Birn 7×7 Zeta Series sketchbook. 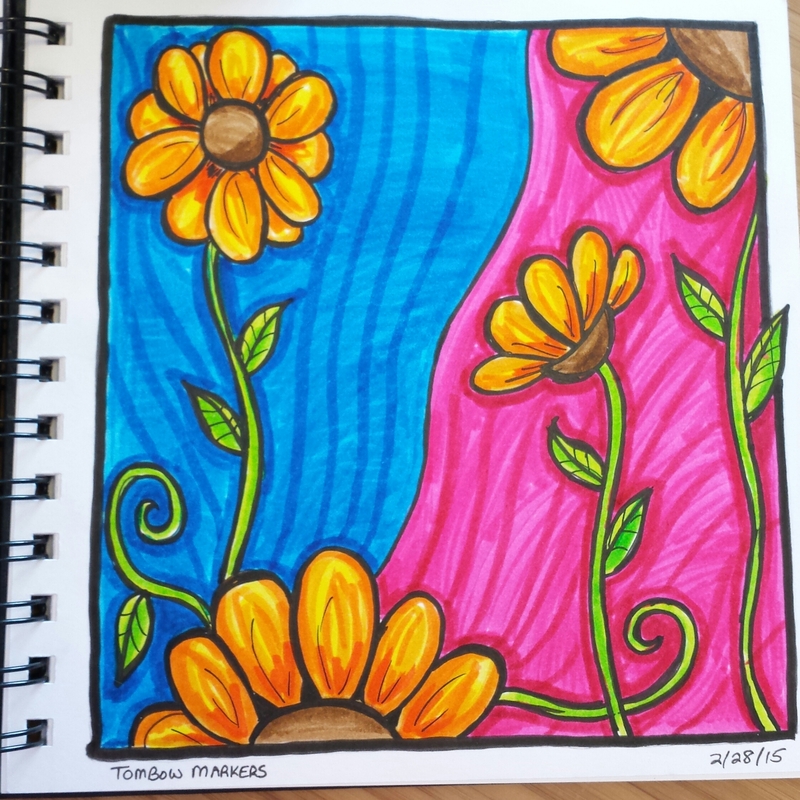 I love the bright white paper that gives my brightly colored markers that visual “pop” I’m looking for, cause I’m always about the color! 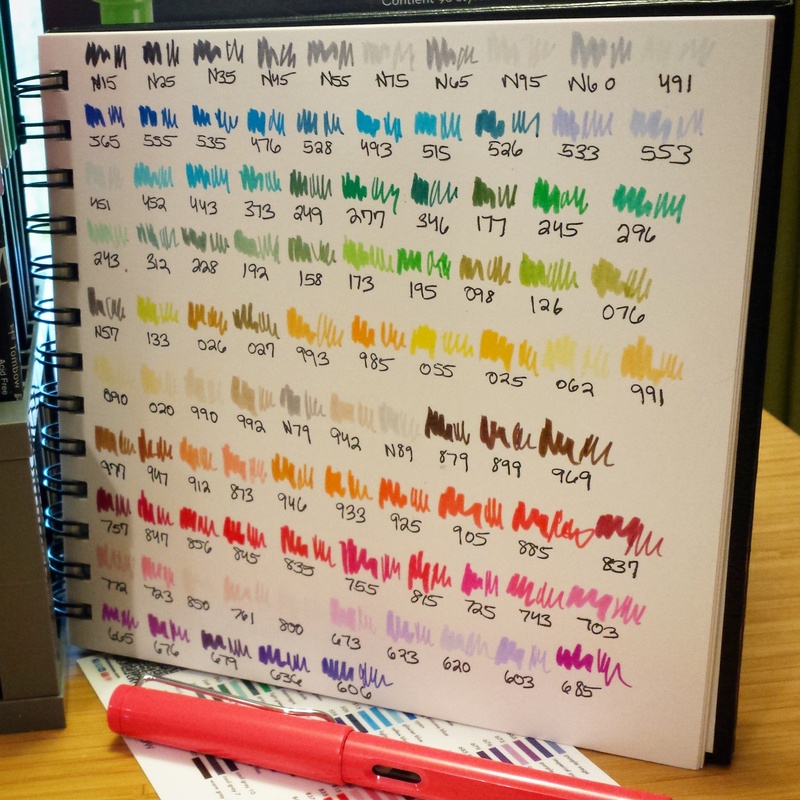 I also like the smooth Zeta Series finish, as it works great with the markers and fountain pens I use, but is still sturdy enough to handle watercolor washes too, for whenever I get that urge. It’s really developing into the ideal combo for me, and as I do more of these sketches I feel like I’m developing a personal style – which is honestly kind of a cool feeling! So this was last night’s creation. 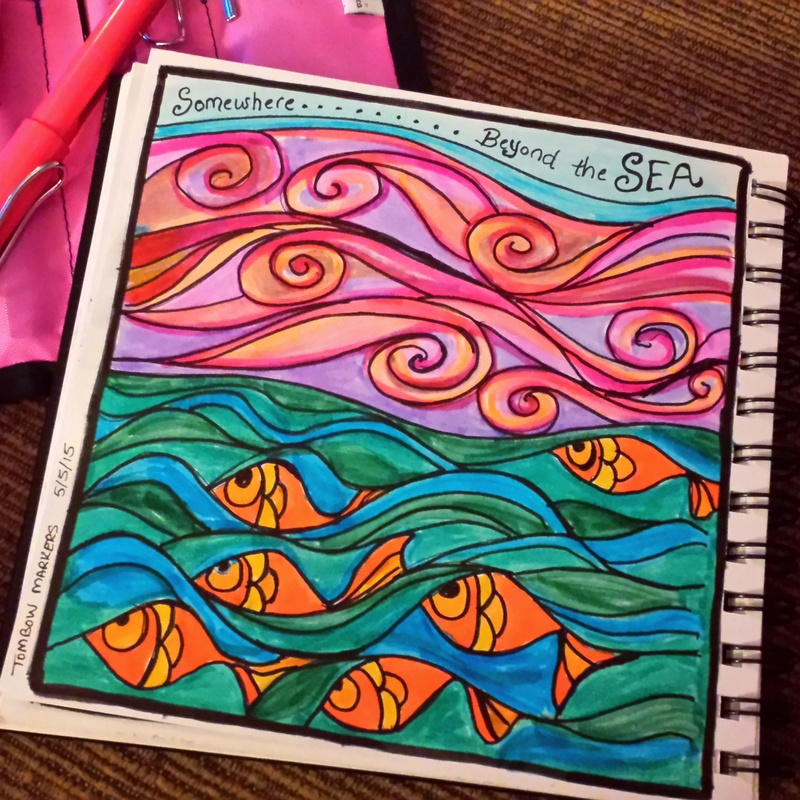 For this piece, I was inspired by artwork I saw that featured this idea of hiding fish in the curves of ocean waves, and thought it was so creative! 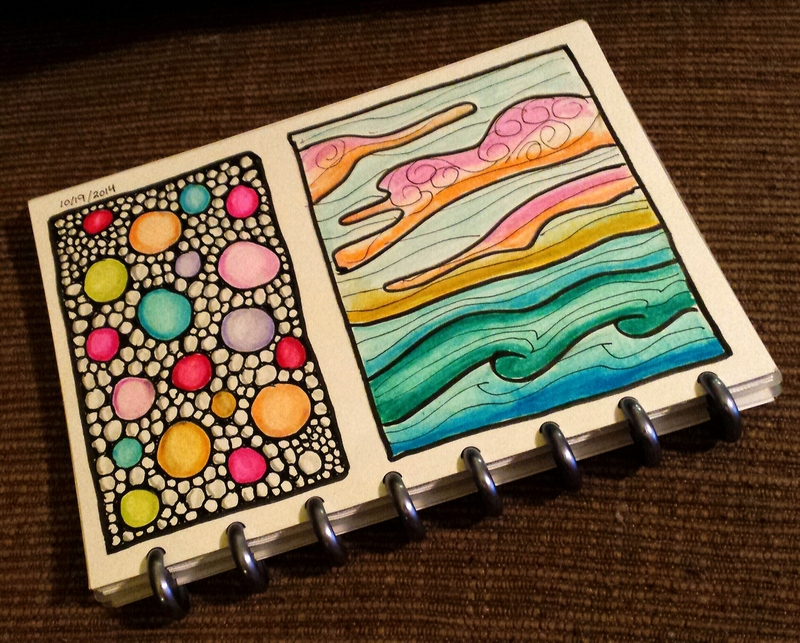 I knew I had to do a similar theme in my sketchbook. But I had no idea what to do for the sky! So I just started making big random swirly clouds to fill up the space, adding color until it just seemed to complement the bottom half of the piece. 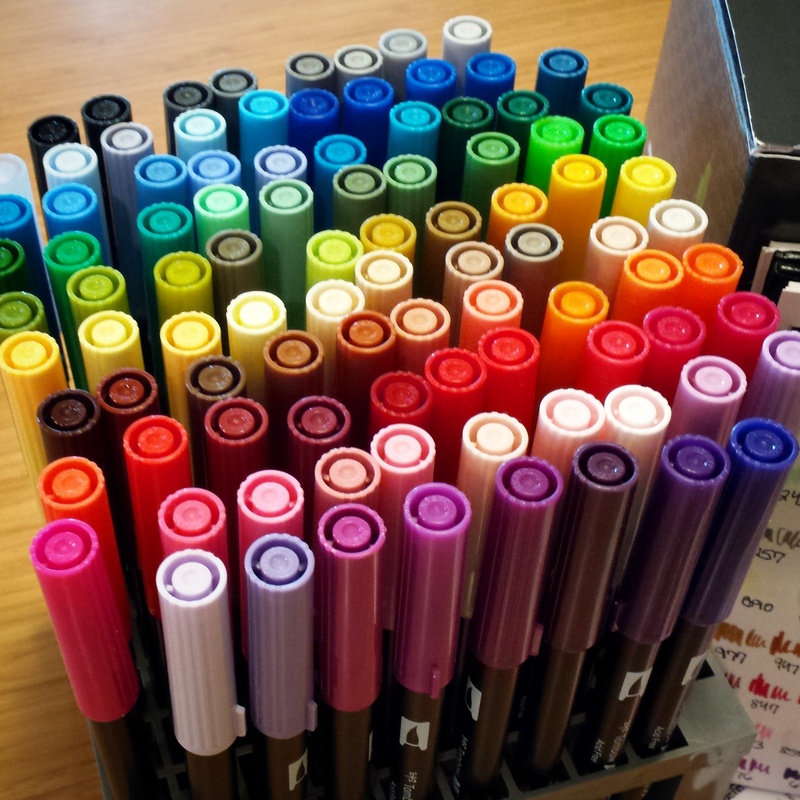 I sketched a basic outline with my Lamy Safari fountain pen inked with Platinum Carbon Black ink, colored the areas in with layers upon layers of Tombow markers, and then outlined them with a black Micron brush pen. I’m never usually certain about the colors or when it’s “done” until I just decide I can’t do anything else with it. 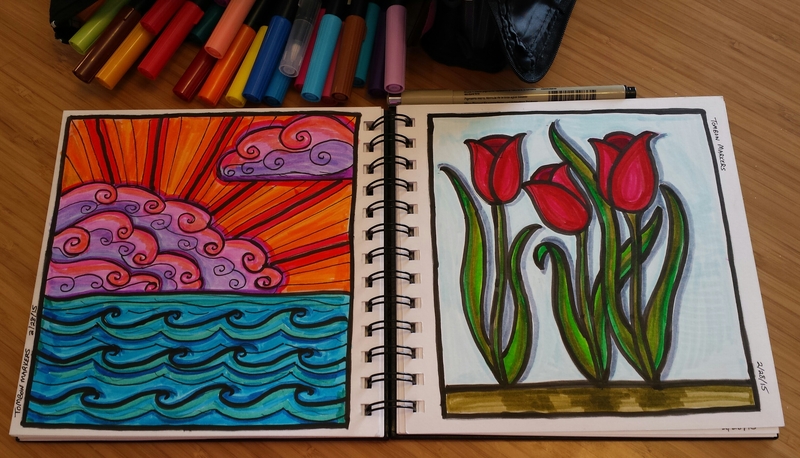 I quickly reached that point with the clouds after outlining them in, and was like that’s it! I’m calling it! Also, I’ve had the song “Beyond The Sea” stuck in my head EVER SINCE. I like the original Bobby Darin version best, but also my mind immediately thinks of Finding Nemo now too. Because, it is AWESOME. 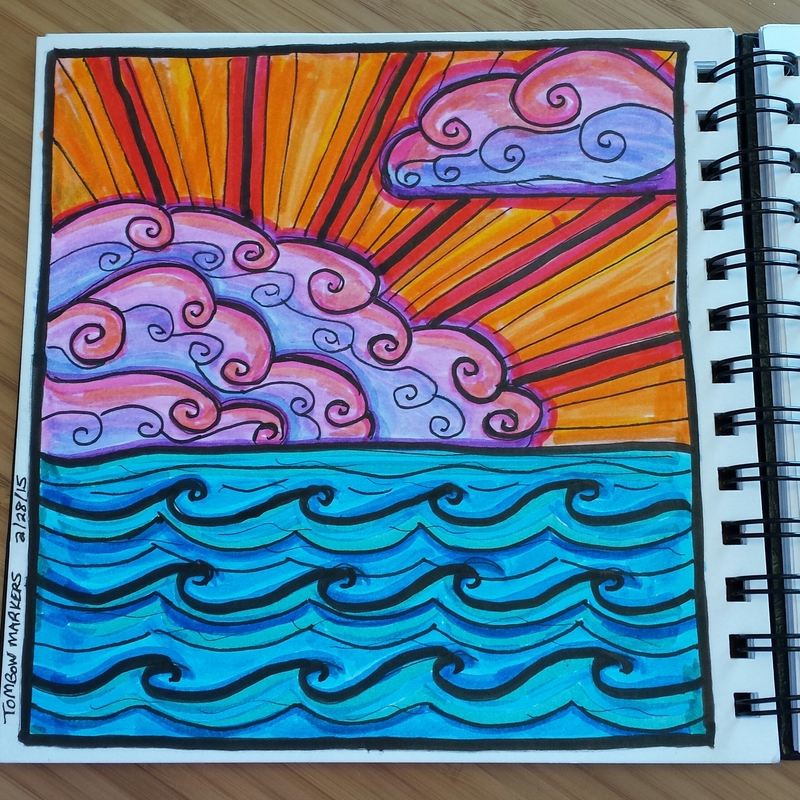 *UPDATED 3/19/15* Stillman & Birn featured the Summer Breezes sketch on their blog and social media feeds! Check out the post here. 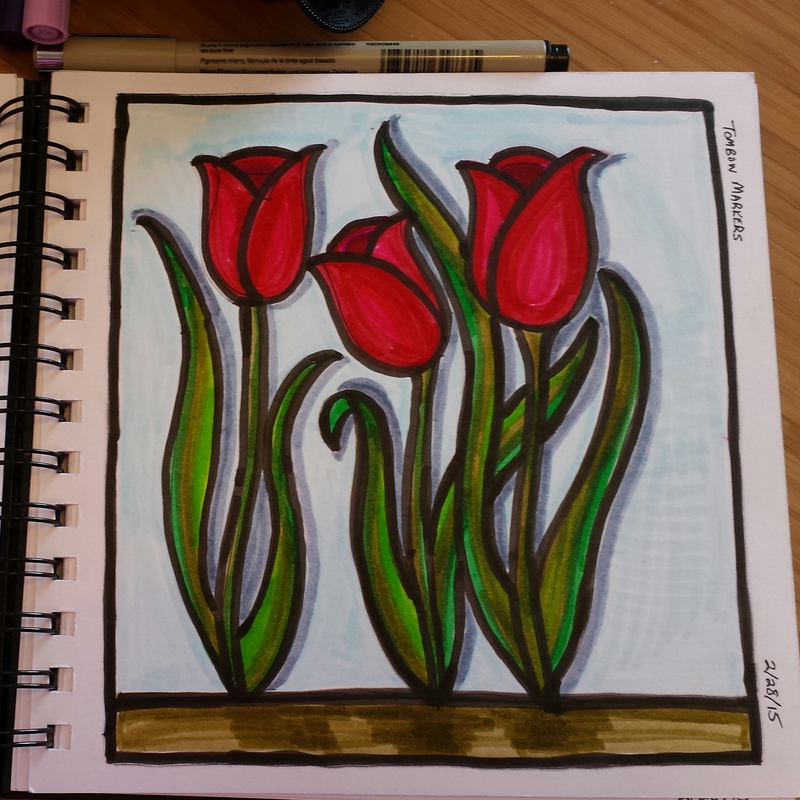 This weekend, while it was cold and snowy outside, I finally had the chance to play with my Tombow dual brush markers, and am so impressed by how bright and vibrant they are! As soon as I got started, these warm happy colors just had to come out and play. I was unusually inspired, as I did not one but SIX sketches with them. Technique: sketch lightly with Micron .03 pen, color in sections with Tombows, adding layers and details as needed, then finishing and outlining with either a Micron 1.0 or brush pen. 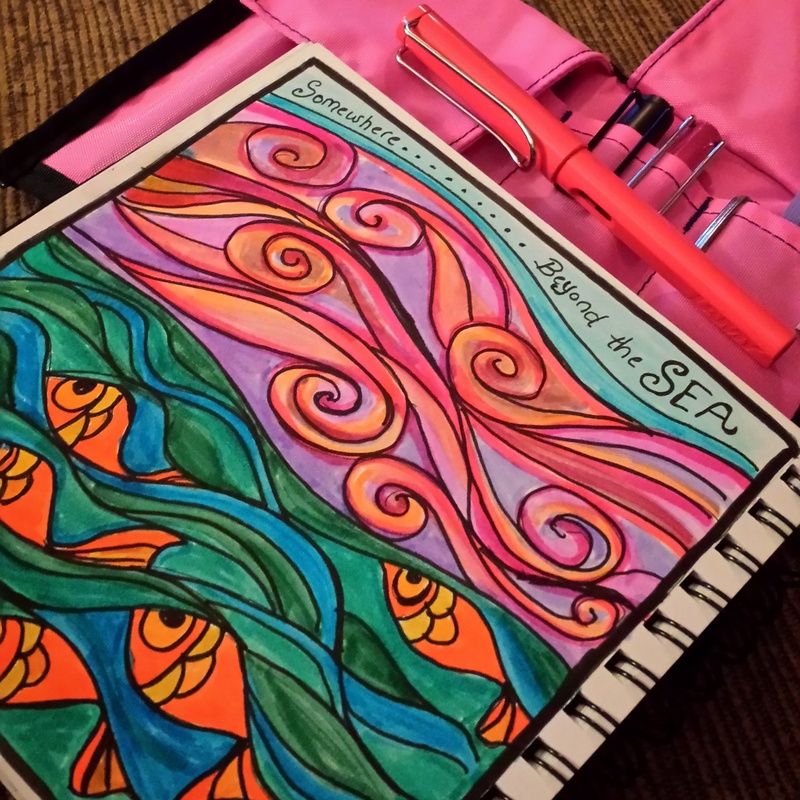 Sketchbook Used: 7×7 Stillman & Birn Zeta sketchbook. The Zeta Series has “Extra Heavyweight – 270 gsm” paper, smooth and in a bright white. 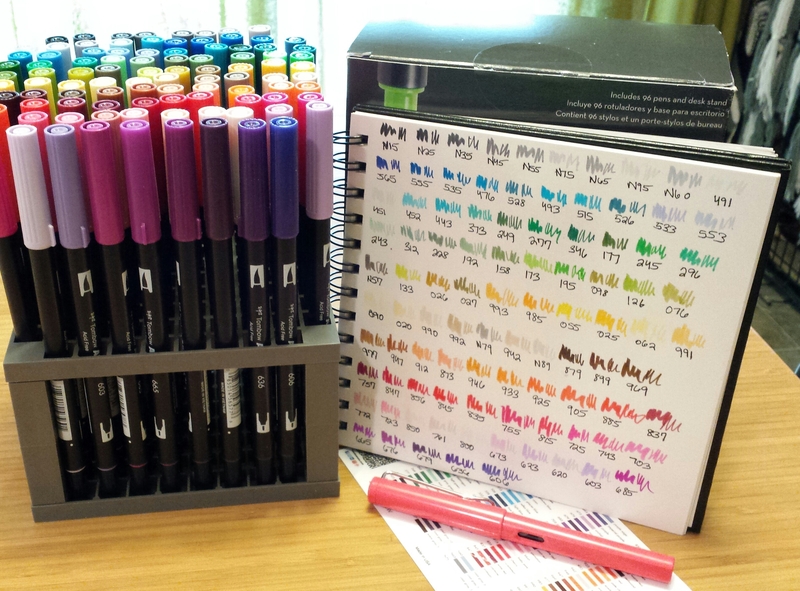 This size in particular is unique in that its square, very portable, and takes washes and fountain pens and watercolors and most everything I’ve thrown at it well. 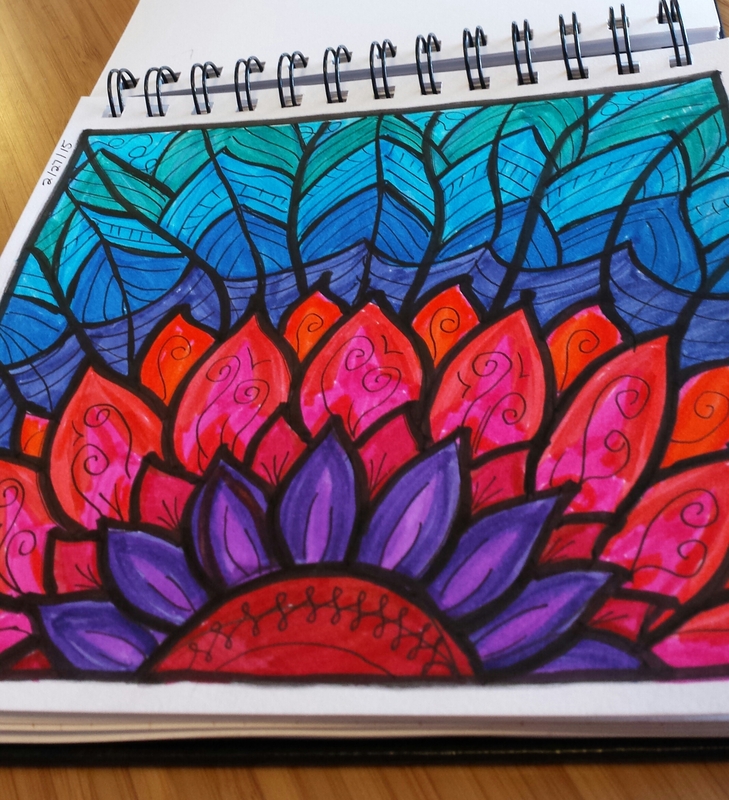 I love bright saturated colors, and the Zeta’s white paper really makes them pop. 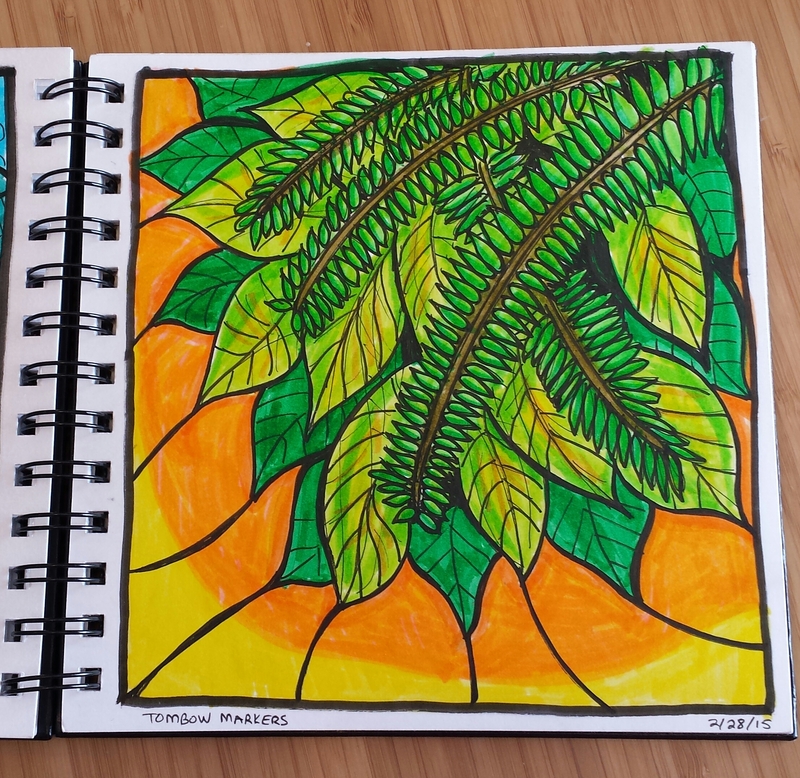 This particular picture – with the green palm fronds on yellow background – reminds me a lot of a past vacation to Miami – summer breezes, green trees and bright bright sunshine. Saw something similar somewhere online (Pinterest, Instagram, I can’t remember exactly), with a side profile of a yellow flower on a blue background, and loved the yellow/blue combo so much had to try it. 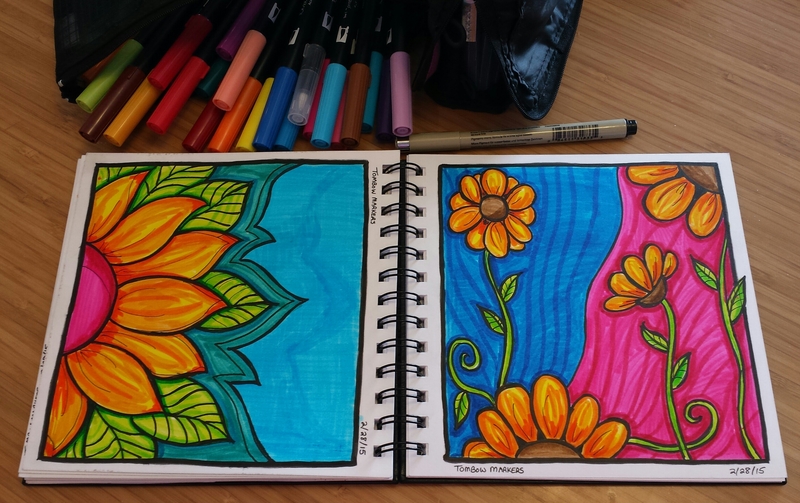 I just really liked how the yellow flowers turned out so I wanted to keep playing with them. Similar to Sunflowers, but with luscious RED. Tried something different with the clouds, but not entirely sure I like the combination of sunset colors with the pink clouds and blue water. But that’s why art is an experimental process! Trying something a little more minimalistic, with some pops of red. 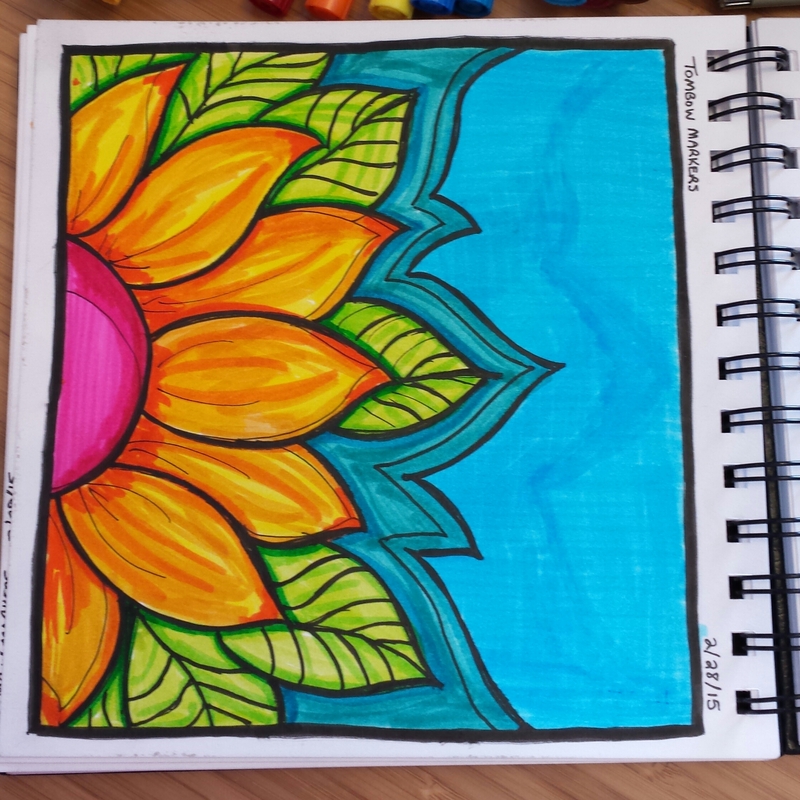 Experimenting with Tombow marker shading tonight.